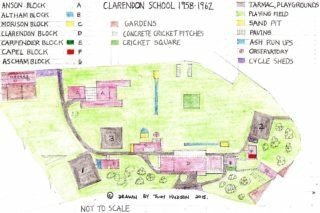 Friend and prolific author, David Reidy, is planning to write a further book on South Oxhey, this time concentrating on the short history of Clarendon Secondary Modern School. He will be delighted to hear from former pupils, teachers and friends of the School, on their memories and reminiscences from the 1950s and 1960s. All contributions, including photographs, will be fully acknowledged. Contributions are now being received by David, who is making steady progress on his new book. My friend of 55 years, Tony Hudson, who still lives in Ashburnham Drive and who attended Clarendon School from September 1958 until July 1962, has kindly sent me details of his recollections of the school and these have been supported by those of his younger brothers, Bob (1961-65) and Phil (1966-71). These should be appearing in the book, along with a “Mental Map” of the site as recalled by Tony over half a century ago. Tony has contacted me to correct his original version of his map and the Mark II is attached here. This page was added on 20/08/2015. 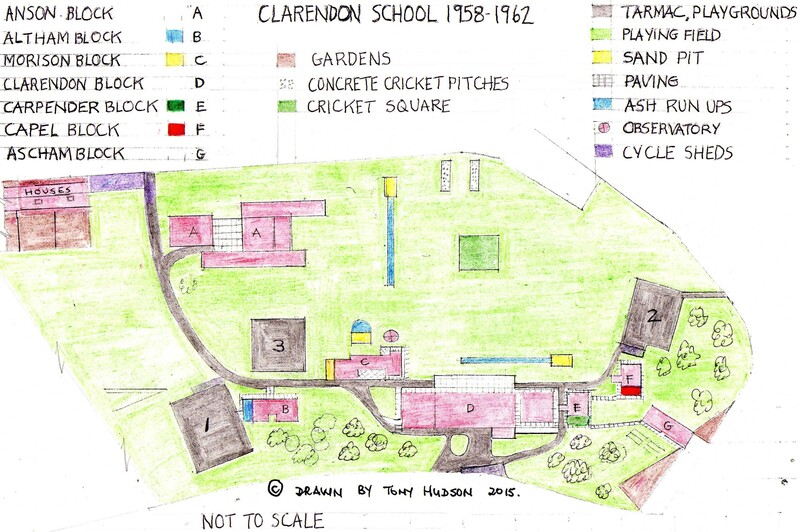 Just found this site, it rekindled very happy times spent at Clarendon during my time there from 1958 till 1964. Retired early to Spain near Almeria with my wife and son, been here now seventeen years. I am still in touch with Neil Palmer (we have been lifelong friends,70 years) with Ron Saunders, Roy Cherrington, Doreen Scully, Pauline Woodward and Lesley White who now lives in Malaga. Unfortunately some are no longer with us, John Thorburn died in 2000 and Pat Gayler in 2010. The 1960’s were a great time to be growing up in South Oxhey, we were in our teens and someone would be having a party somewhere on the estate. I remember Diane Allen having one, the word got out and dozens turned up ,eventually the police were called out as things got out of control. Also remember parties at Ron Saunders, and the Fullyloves’ in Hayling Road. The headmaster, Mr Stewart allowed us to have a disco in the main hall, some of us managed to sneak alcohol in and hid it in the cistern of the toilets in the dining hall kitchen. Somehow Miss West and Miss Jackson who were in charge got wind of this and said that the disco would not take place until the drink was handed over. Once the contraband appeared the two ladies helped themselves to a drop of gin and sherry and the disco was allowed to take place. Some twenty years later I was visiting a maiden aunt in Sidford Devon, came out of her cottage and came face to face with both Miss West and Miss Jackson, before I could say anything Miss West pointed at me and said it’s Byrne. I was invited to afternoon tea in their beautiful home , a converted barn. We talked about the school, and what impressed me most was the number of pupils they remembered. a great memory. Many other memories of Clarendon, Mrs Spinx asking if anyone had a cigarette to spare, and Mr Sellars pouring a bottle of milk over a child’s head, in fun of course. So many more stories and happy memories. Does anyone know the Hooper family, Irene and Pat, I’m trying to trace them. I was born 1940, and was head boy and chess champion and left to go to Watford Technical College. I have very few memories of my time there, but a few years ago whilst in Spain met a lady in a wheel chair who recognised me, was in my class and knew all about me, as she started talking memories flooded back. Good to hear from you, Wendy. 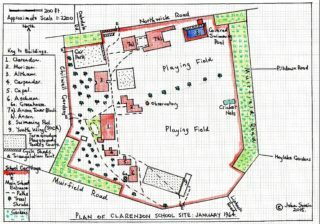 I’m sure that David Reidy would like to have further details from you on those early days at Clarendon, particularly as you became Head Girl in your last year. I was also interested to note that you have been living in Perth, Western Australia, a city I visited in October 2013 for a 10-day holiday, during which I met up with former Oxhavian, Terry Collyer (Clarendon 1960-65, ex-Puttenham Close). Small world, ain’t it? I reckon almost 10% of former pupils have subsequently settled Down Under from the 1960s onwards. All good wishes, John Swain (South Oxhey resident 1953-65 and elder brother of Peter Swain, Head Boy 1961/62). I was a pupil at Clarendon from 1952-56.My name then was Wendy Cooke and I was head girl in my last year.I have very fond memories of the school.Mr Stewart was head master,Mrs Legalle headmistress.I was in Carpender block.I remember the crusader,where we would sit and eat lunch.Netball behind Carpender…the large lunch hall with the serving hatch…spent many hours writing ‘lines’ in that hall.Assembly was very formal with Mr Stewart in his gown.Mr Shaw (maths) was a great teacher,but scared the life out of me.The art teacher..Mr Lord was a great guy.I ended up becoming a graphic designer and hereldic artist.Mr Sandbach…history ..was very eccentric,but an excellent teacher.The sixth form had their own room upstairs off the balcony where we were to study..!! A lot if the time the lads played cards.Discipline was paramount in the school,something I remember well.There were very few ‘incidents’ with pupils. Sue, thanks for putting me right about the observatory, I watched it being built with the dome being of fibreglass panels that were made up by the metalwork team and sundry volunteers for what was a very dirty task. I could have sworn it was where I thought it was but the memory plays funny tricks! 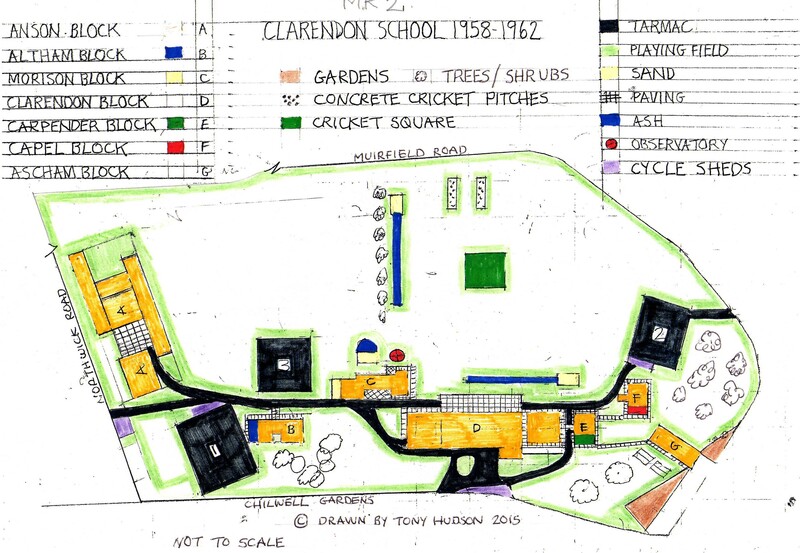 Also, I believe there were cycle sheds close to the lower playground just before you cut to the teaching blocks. Also, reference to the Crusaders statue would have been good. Minor points but John is generally very meticulous in these things. Regards, Peter. 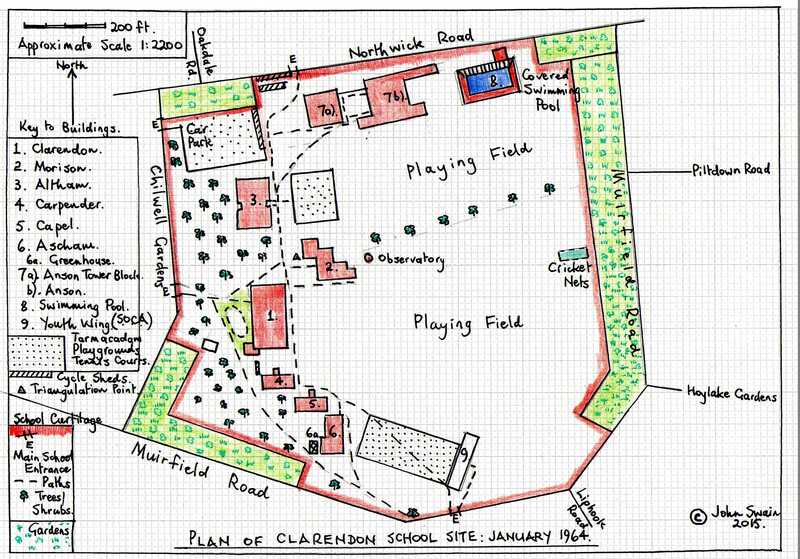 A good map, but I thought the observatory was in front of Clarendon block and not at the back of Morrison. Where you have placed the observatory there was a high jump pit. Also, the cricket nets were closer to the trees that divided the playing field area. That’s just my recollection of things. John does have the observatory in the right place, although it was slightly further to the right but definitely behind Morrison block.